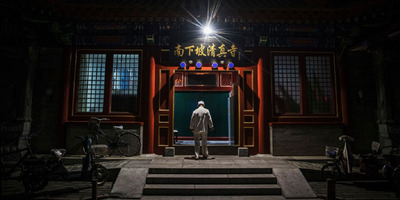 Kevin Frayer/Getty ImagesA man from the Hui Muslim community stands in front of the Nanxiapo Mosque in Beijing, China. Chinese Muslims embarking on the annual Hajj pilgrimage to Mecca are being outfitted with GPS trackers in what experts are warning is likely part of China’s widespread surveillance programs. The state-run China Islamic Association said the purpose of the system is to make the trip safer for the thousands of pilgrims required to wear the device. However, experts say that many Muslims in China are closely monitored by the government, and the trackers are likely an extension of the surveillance systems already in place. Chinese Muslims embarking on the annual Hajj pilgrimage to Mecca are being outfitted with GPS trackers in what experts are warning is likely part of China’s widespread surveillance program already in place. This year, about 11,500 Chinese Muslims are expected to head to Saudi Arabia for the month-long Hajj celebration, beginning on August 19, a slow decline from 14,500 in 2016 and 12,800 last year. State-run China Islamic Association, which claims to represent ethnic Muslim groups in China, posted photos of the first batch of Chinese Muslims preparing to depart for Mecca. Photos show pilgrims wearing GPS trackers around their necks as they prepare for their journey. According to the Global Times, each device includes a QR code connected to an app that reveals the wearer’s photo, passport number, address, and name in both Chinese and English. The Islamic Association, which closely monitors and organizes the Hajj trips, claimed the devices make the trip safer for the user. “Using the GPS, the app can also help Chinese organisers see the real-time location of the pilgrims, which organisers say will help facilitate management of the activity that lasts nearly 40 days,” a trip organiser who did not want to be identified told Global Times. However, experts say that this system likely hints that the government is looking to exapand surveillance on its citizens – particularly those in the Muslim minority. “Chinese Communist Party officials have often justified invasive policies with the excuse that they address legitimate “safety” concerns,” Timothy Grose, a China expert at the Rose Hulman Institute of Technology, told Business Insider. Muslims in China, including the 8 million Uyghurs of the Xinjiang region, are required to apply for permission to embark on the Hajj and are carefully vetted based on their age, ethnicity, and social standing. But Uyghur Muslims have been required to first pledge their allegiance to the Communist Party before they are allowed to leave the country. Government surveillance of Uyghurs permeates almost every aspect of their lives. They are subject to extensive security checks in public places, including gas stations and shopping centres. Authorities use an expansive network of 40,000 facial-recognition cameras to monitor Uyghur activity, and recently began collecting DNA samples, fingerprints, iris scans, and blood types from all Xinjiang residents aged between 12 and 65. China also has a system of high-tech bird drones which it has deployed in five provinces across the country to keep a close eye on its citizens’ movements. Grose doubts that safety is the motivating factor for enforcing tracking devices on Muslim pilgrims, as Hajj trips are already organised and closely monitored by state officials. Ma Mingyue, a staffer from the Islamic Association told the Times that about 3,300 pilgrims, mostly from the southwest Yunnan province, will be wearing the monitors this year. Pilgrims from Xinjiang, who are subjected to some of the most intrusive surveillance programs in the world, aren’t wearing the devices this year. The number of Chinese pilgrims attending the Hajj has slowly been decreasing since 2016, from 14,500 to 12,800 last year. More than 2.4 million worshippers descended onto the Islamic holy site in 2017, and millions are expected this year.